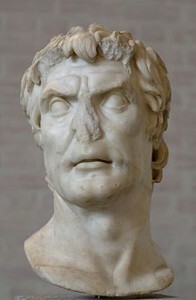 As I introduced in a previous post, at the heart of Operation LAPIS is a collaborative role-playing experience that continuously and actively reinforces the primary learning objectives for the course: learning how to read, think, and act like a Roman based on an understanding of the culture as a whole. In this post I’ll try to explain the mechanics of that collaboration in greater detail: I’ll describe how it is assessed and what it does for learning and engagement. The overarching narrative in Operation LAPIS revolves around an ongoing quest (on the part of the students) to discover the secrets of the lapis saeculōrum – the stone of the ages – while being wedged between two competing groups; the Militēs Lapidis (the Soldiers of the Stone) and the Societās Potentium (the League of the Powerful). Now the lapis is completely fictional, as are the ML and the SP, but they’re designed to explain the struggle between the optimatēs and popularēs, the rise of the great generals at the end of the Republic and the use of political propaganda as manipulation of power. The narrative itself is divided into thematic missions with 3 episodes each. Most episodes span three or four nights and are accomplished inside a Matrix-like simulator known as the TSTT (disguised as a simple internet forum). A few of the features in this “immersion session” are characteristic of every such session, and are designed to increase accessibility and engagement–that is, they serve as “scaffolding,” to use a convenient term from the literature on instructional design. First, the narrative is a mix of English and Latin. The Latin portions are vital and cannot be skipped but the English portions serve to make the narrative easier to follow (and thus keep them engaged in the on-going plot). Making everything about the course more accessible is one of the fundamental goals. We also include a specific prompt to help guide their discussions and decisions about what actions to take. 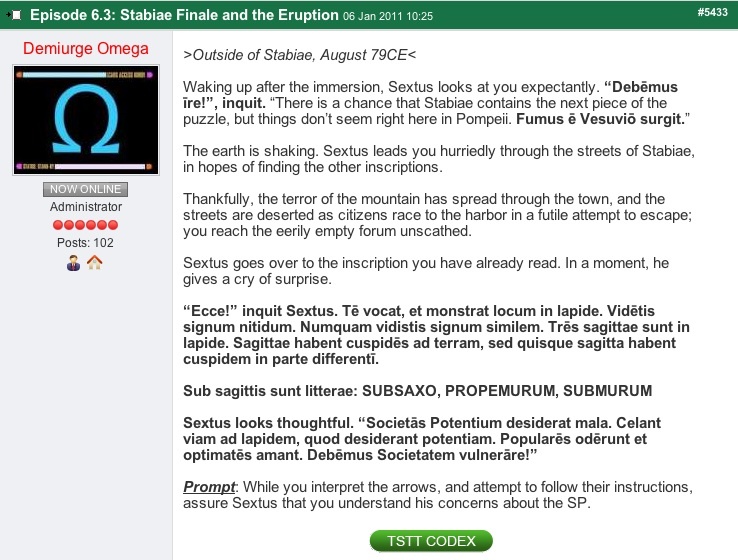 Lastly, every episode has a specific supplementary resource (the CODEX) that acts as support system. I’ll spend more time in a future post describing the role of the CODEX and its significance in the learning process. Upon viewing the initial immersion, the operatives then log into their specific team discussion forum — a place only the four or five operatives who are ‘controlling’ that particular character can access — and begin the collaborative process. The asynchronous nature of the forum-discussion serves this collaboration very well: operatives can log in whenever it’s convenient for them. For high school students this capability makes the process easily manageable alongside sports and other activities that regularly fill their lives. Throughout the night, the operatives engage in an ongoing discussion on how to best respond to the prompt in the role of their individual Recentii (player-characters). They inform their contributions by making use of the resources in the CODEX, they take into account their characters’ world-views, and they use as much Latin in their response as they can. Did I mention that this class of high school freshman have now arrived at a pretty good understanding of the conflict between the optimatēs and popularēs? Most teams came that night to the realizations outlined above about those groups and grasped their parallels to the fictitious groups (the Societās Pontentium and the Militēs Lapidis) created by the development team in the story and mechanics of the practomime of Operation LAPIS. I have observed from my perch as Demiurge that the majority of students were able to make those connections not because they read an assigned text but because they were acquiring that information in order to make an informed decision about the actions their characters were going to take inside the immersion session. 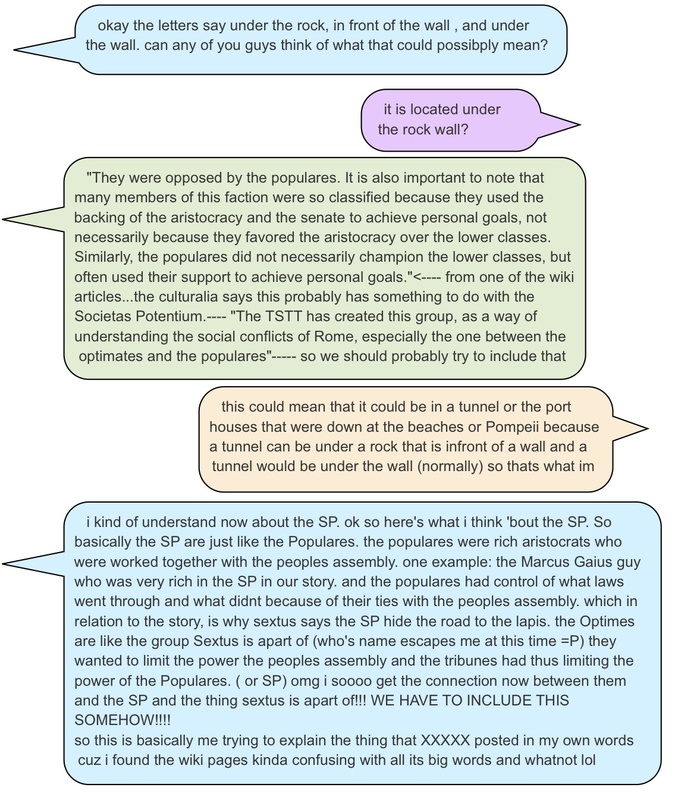 It’s also worth pointing out that the students also have several different discussions going on simultaneously: one about the nature of the optimatēs and one about the various clues found in the forum of Stabiae that will help them on their quest; together these discussions form an ideal learning activity both to experience immersion in the culture of ancient Italy and to activate the knowledge gained in that immersion into skill at the study of that material. Here an entire course framed around collaboratively roleplaying a character in a persistent narrative really starts to show impressive affordances for learning. This exercise to understand better the role of the optimatēs and popularēs wasn’t a brief modular experience outside the context of the rest of the course objectives. Instead, it was part of an ongoing quest both inside and outside the immersion that maps the learning objectives directly onto the play objectives. In other words, to understand how to proceed forward in their quest to find the lapis, the operatives (students) had to first understand the conflict between the optimatēs and the popularēs; in order to proceed forward in their quest to complete the course requirements (i.e., get a good grade), they had to understand first the conflict between the optimatēs and the popularēs. If you’re a teacher, you’re undoubtedly asking how the students’ work in these collaborative discussions is assessed. First, because the discussion takes place on a forum, the complete record of every team member’s contribution to the discussion is maintained until the end of the course, so there’s never any question of who contributed what. When I make the actual assessment, I evaluate the sum total of each student’s individual contributions. Have they considered their character’s world-view? Have they drawn upon previous experiences in course and current supplementary resources to make informed decisions and comments? Have they tried to use familiar Latin constructions in their character’s response in the immersion thread? Based on the thoroughness of their contributions, operatives can earn up to a maximum 200 Latinity Points for each episode. Ultimately this episode led them to an encounter with Pliny the Elder (complete with a pillow tied to his head) and then at last to their death-by-incineration as a result of the eruption of Mount Vesuvius. But don’t worry, after exams their characters are to be resurrected in Roman Britain to continue their quest for the lapis saeculōrum.